As of July 1, Transit Director Andi Howell will have truly put Sandy Transit on the map. DoubleMap that is. DoubleMap is just one of the new services and features recently implemented on Sandy buses. It's an app, downloadable on smartphones free of charge, which allows riders to track public transportation in real time. You'll also be able to go to any stop on the map and see how accessible it is — or isn't. The app tells you if there's a sidewalk or crosswalk or ADA-compliant ramp. It can give you estimated arrival times, and the transit staff can send messages about different stops and possible delays through the app to let you know if you need to catch a different bus or if you'll have a longer wait. "It was important for me that if you have mobility issues you can find out if there's a sidewalk and how accessible it is," Howell said. Transit buses have also gotten an upgrade in how drivers track information on the go. Every bus, Mt. 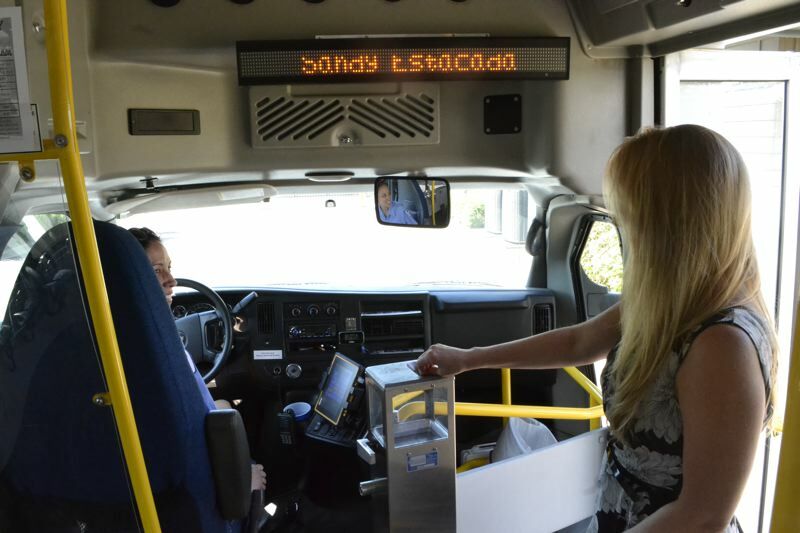 Hood Express buses included, now has a tablet with which drivers can track the number of riders, demographics of ridership and more at the press of a button. Before they had to use pen and paper. They can also complete their pre-trip and post-trip reports with the tablets. This could possibly save drivers time, and also make reporting statistics to the government — a requirement of Howell's — easier. "It will generate way more reports possibly than we'll ever need," Howell explained. "Plus, with all grants come a lot of reporting, so this will make it so much easier to have all of that data in one place." Besides the announcements received through DoubleMap, the buses now also have a new announcement system built in. Eleven of the Transit buses now have interior LED destination signs automated through a GPS system, which also announce stops audibly as they come up. "If you have any hearing issues, it's visual," Howell noted. "If you have vision issues, there's also audio." Most of the funding for these new features was provided by a grant from the state Transit Network program, which the department received in 2016 and implemented in 2017. The grant amounted to $79,000, and with a match of $9,000, the department was able to make improvements to the buses. The total cost was $88,000. "We actually got a lot for that," Howell noted. "This project brings (Sandy Area Metro) into the 21st century and puts information into the hands of our customers. I could go on and on about all the benefits of this new system to our service."